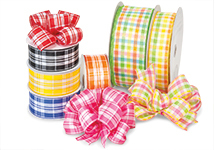 Ribbons and Bows at Wholesale pricing! 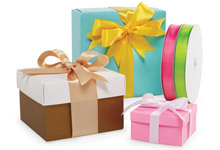 Beautifully formed gift bows every time! 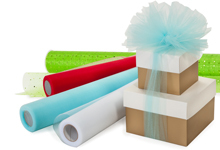 Available in a variety of colors and sizes to fit your packaging needs. 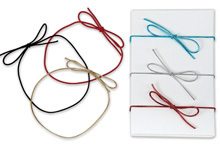 Pre tied satin bows with twist ties are perfect to tie cello bags! Now on Sale! 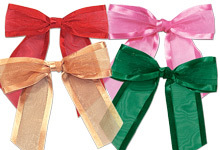 Sheer organza ribbon in a variety of sizes and colors! 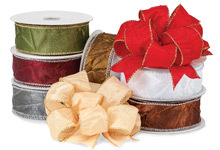 Double Faced Satin Ribbon has a luxurious, shiny satin surface on both sides. Now On Sale! 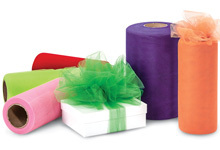 Great value pricing on tulle rolls in popular colors and sizes. 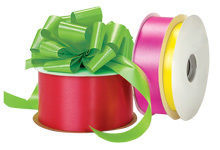 Quality curling ribbon for balloons, hair bows, and gift wrapping! 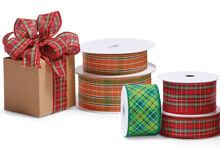 Double Sided Fabric Wired Ribbon featuring a classic plaid design. 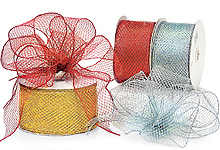 Premium nylon netting color tulle perfect for skirts, tutus and other crafts. 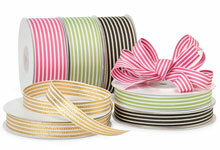 Natural Tone Grosgrain Ribbon featuring a colorful stripe design. 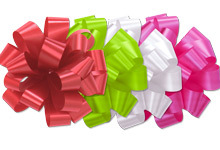 Elastic pre tied bows come in several colors and sizes to fit any gift box! 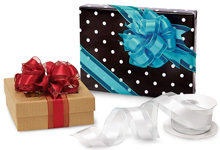 Wide satin pre tied elastic bows stretch to wrap around gift boxes! 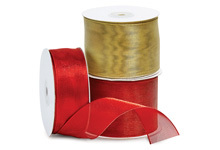 Pretied elastic bows in metallic red, silver, and gold. 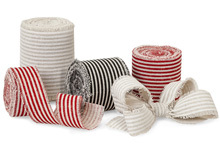 Ribbed Fabric Ribbon available in several solid colors and sizes. 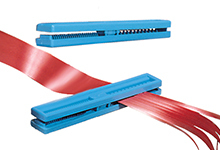 Sheer Encore Ribbon is very sheer ribbon with a lightweight wired edge. 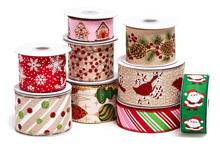 Beautiful poly ribbon is available in many colors on large wholesale rolls. 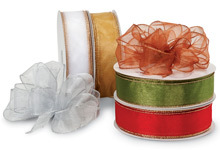 Organza ribbon is delicate sheer ribbon with wired satin edges. 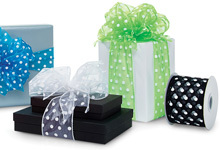 Sheer organza ribbon with white polka dots and a wired edge. 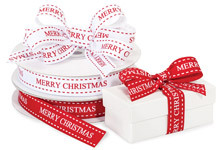 High quality double faced satin ribbon makes luxurious bows. Now On Sale! Cute, quick and easy! 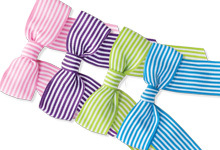 Perfectly formed butterfly pull bows in four classic colors. 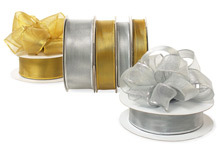 From solid metallic gold or silver to sheer ribbon with satin edging, these pull bows make gifts look good! 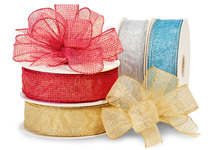 Wholesale priced shiny tulle ribbon has a metallic shimmer. 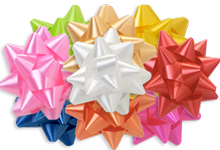 Easy to use peel and stick Star Gift Bows in fun and festive colors! Now On Sale! 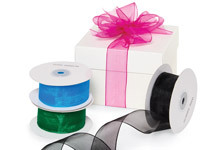 Wired organza ribbon with a smooth satin stripe through the center. 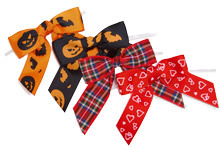 Pre tied grosgrain gift bows are striped on both sides and have twist ties for quick use! 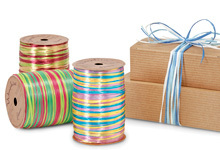 Soft Woven Grosgrain Ribbon featuring two sides of colorful stripes. 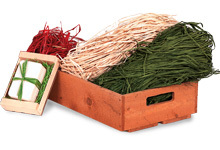 Rustic Natural Jute Ribbon features a firm open weave in five sizes. 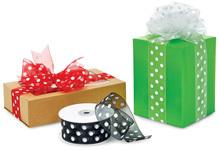 Sheer organza ribbon with coordinating printed polka dots. 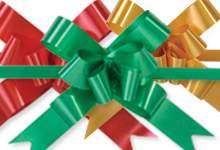 Printed curling ribbon for festive balloons, bows and Christmas gift wrapping. 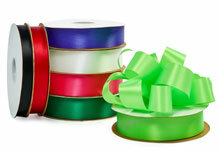 Lightweight Woven Grosgrain Ribbon in three sizes and several colors. Now on Sale! 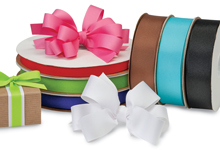 Paper raffia gift bows with a twist tie to attach easily to gift bags or gift baskets! Now on Sale! 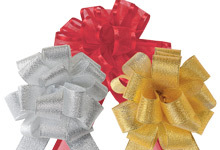 Self stick prenotched pom hank gift bows wont crease during shipping! 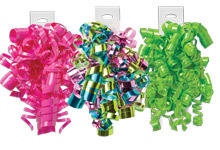 Curly Bows with adhesive hang tab in gloss or metallic colors. 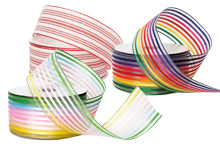 Sheer ribbon with iridescent or metallic striped threads. Final mark down ribbons! Several designs to choose from including seasonal and everyday. 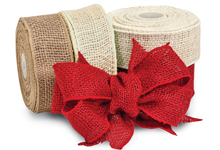 Stylish Burlap Ribbon with a wired edge is made from natural jute. 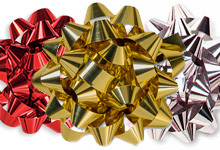 Fun, bright, glossy and metallic colors for Christmas and gift wrapping! Now On Sale! 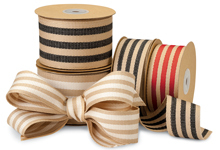 Soft Woven Burlap Ribbon with classic two toned stripes. Sheer organza ribbon with glitter swirl accents. 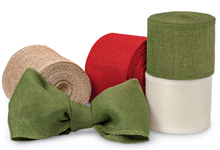 Rustic Natural looking ribbon is made of lightweight woven polyester. 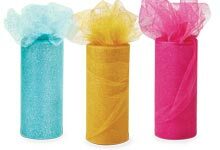 Value tulle with glitter will add sparkle to your gift packaging! 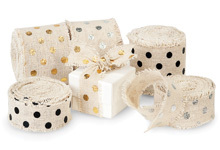 High Quality Natural Linen Ribbon featuring bold metallic polka dots! 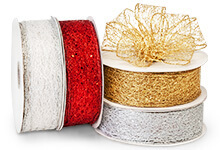 Shimmer organza ribbon with a metallic wired edge. Gorgeous Sheer Ribbon with a wired metallic edge always holds shape! 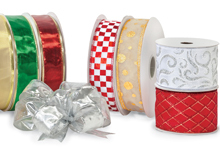 Festive Solid & Printed Wired Ribbons make the perfect Christmas bow! 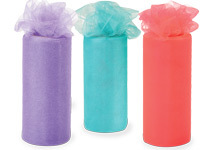 Wide rolls of solid color tulle ribbon and organza tulle with sequins. 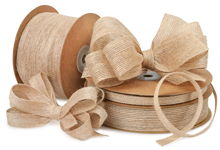 Wide Natural Burlap Ribbon with lightweight sewn edge is easy to tie! Natural Crinkle Paper Ribbon made with nontoxic and watersoluble ink. 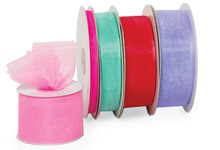 Sheer Organza Ribbon with a heavy wired edge in bulk rolls. 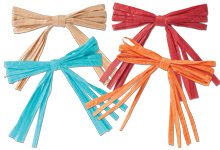 Linen Fringe Ribbon with vintage bold stripes and rustic frayed edges! Wired Metallic Ribbon features an open lace weave with shiny sequins! Now On Sale! 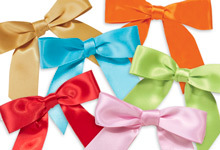 Pre tied sheer organza bows with twist ties are the perfect finishing touch! 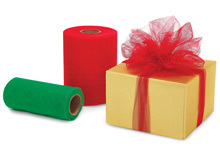 Pretied velvet bows add an upscale holiday look to packaging. 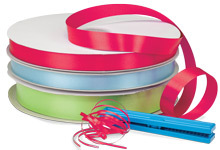 Simple to use ribbon shredder gives regular ribbon a fun fringed look. 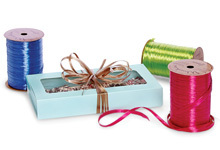 Trendy geometric woven ribbon add glitz and sparkle to your Christmas packaging. 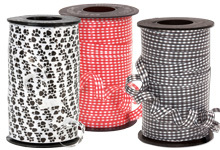 Fun Natural Linen Ribbon with frayed edge in black or metallic dots! 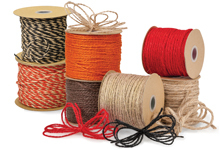 Unique Sustainable Mesh Ribbon in natural or metallic threads. Unique Metallic Mesh Ribbon with a stretchable wired edge! 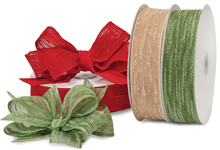 Unique Wired Edge Ribbon featuring natural holiday prints and solids. Shimmery Wired Metallic Sheer Ribbon quickly creates an upscale look! 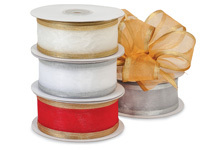 Shiny satin ribbon with a crushed texture has a beautiful metallic threading on the wired edge. 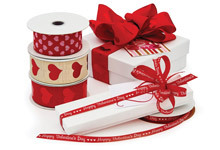 Deluxe Linen or Wired Satin Ribbon with glitter or metallic hearts. 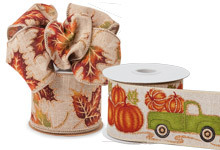 Wired Ribbon in autumn colors and prints create the perfect fall bow! 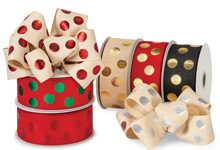 Metallic selfadhesive Confetti Gift Bows are great for Christmas! 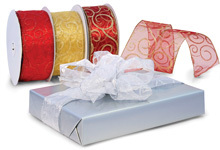 Luxurious Holiday Ribbon with fine stitched edging in six colors. Sheer shimmer organza ribbon with brushed metallic satin edges. 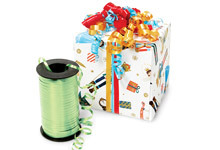 Traditional Designs Wired Ribbon in beautiful holiday colors! 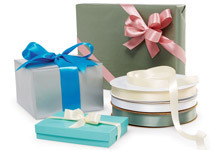 Ribbons and bows provide the perfect finishing touch to your packages. 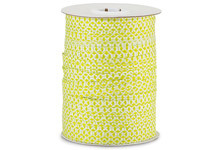 They can provide an upscale focal point or a show your fun side with bright colors and fun prints. 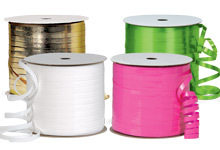 Nashville Wraps has hundreds of choices of ribbons and bows to choose from, all in one place! 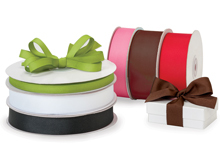 Our double faced satin ribbons are made from the highest quality fabric. 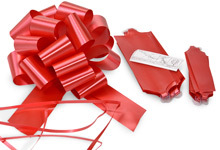 These ribbons are easy to tie, and make beautiful bows. We can custom print these, and other, ribbons quickly in house for your weddings or special events. 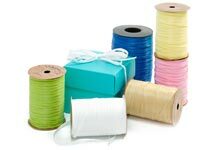 Cotton, jute and grosgrain ribbons are the perfect choice for natural packaging. 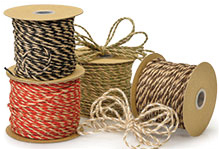 Cotton and Jute ribbons come in several size and even print options to suit your style. 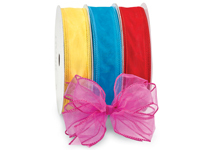 Grosgrain ribbons are great for hair bows for little girls or cheerleaders, and with our wide range of colors, you are sure to find your team colors! 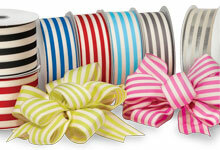 For more great ideas on using fabric ribbons check out our blog on Ribbon Ties for Father's Day! 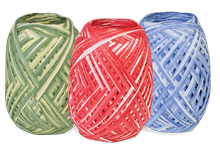 Raffia ribbon comes in more colors than you could ever imagine! 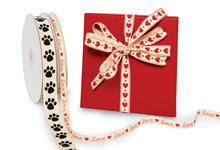 This versatile ribbon can be used on gift bag handles for a simple but stunning finishing touch. 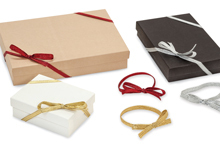 Combine colors and finishes to really add a pop of style to your packages! 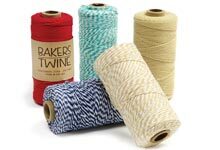 Choose from one of our many jute twine or baker's twine colors. 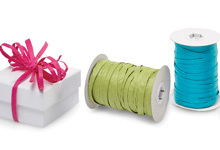 These petite ribbons are great for tying cello bags or making bows on smaller packages. 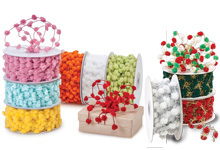 Twine can be used for so much more than just bows! 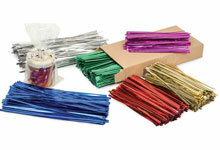 Check out our blog on how to make tissue tassels for decorating at a party! 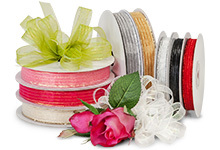 Sheer organza ribbon comes in so many sizes and styles, the possibilities are endless! 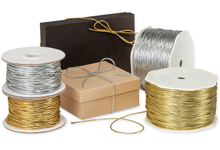 Whether you are looking for ribbons to use for your wedding pew bows and bouquets, or to tie a gift basket- look no further than Nashville Wraps wide selections! 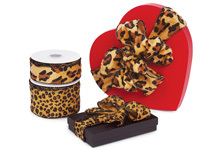 We know not everyone has the ability or time to tie beautiful bows for every package! 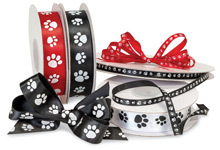 That is why we offer such a wide range of pre-tied and self-adhesive bows! 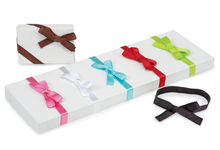 Our pre-tied bows are perfect for pairing with printed cello treat bags for a quick and easy packaging for your gourmet treats! 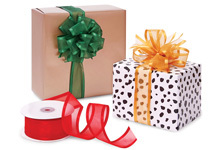 If your store is offering free gift wrap, choose from one of our hundreds of self-adhesive bows or pull bows to provide consistently beautiful packaging!